This Spring, fans of the Northeast Texas Choral Society get another opportunity to see and hear the 100-voice Northeast Texas Choral Society perform. 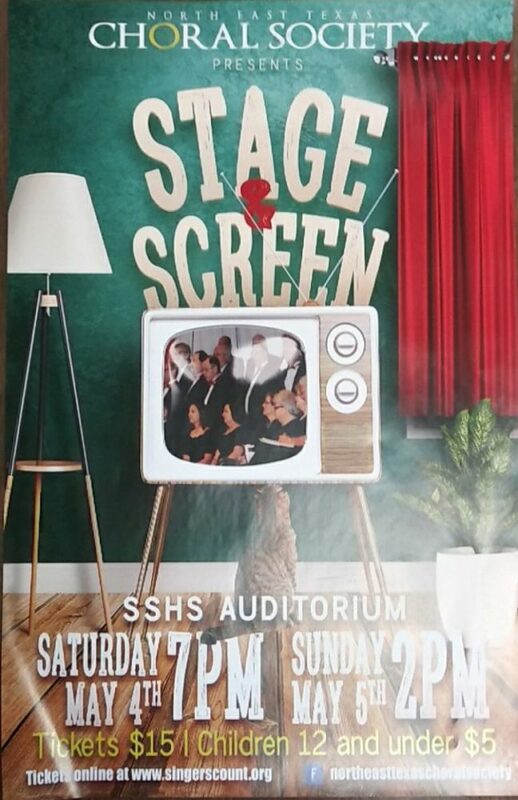 Their “Stage and Screen” concert is planned for May 4 and 5 in the Sulphur Springs High School Auditorium of the Civic Center. Designed to feature the familiar theme songs of favorite TV shows from “I Love Lucy” to “Mr. Ed” to “Hawaii 5-0″and others, there will be many you can sing along to. Versatile singers and soloists will transport you to the stage with selections like “Bring Him Home” from “Les Miserables” and other beloved works, then whisk you to the big screen too with songs from “Grease”, “Sister Act”, “Sound of Music”, “Beauty and the Beast” and a solo performance of “Can You Feel the Love Tonight” from “The Lion King”, and more. For fun, concerts always include costuming and action, often combined with special effects, guest soloists, dancers and unexpected surprises! As Director Carol Allen explained, “Concert is always a real show…fun entertainment for the audience with some real stand-out moments! Kids will love this show, so families, bring your children. For young and old, it’s a chance for everyone to re-live the music we heard “back then” and come away uplifted and inspired. Every song will be somebody’s favorite. Don’t be surprised if you drive around singing these tunes in the car!”. The concert schedule is: Saturday May 4, 2019 at 7pm and Sunday May 5, 2019 at 2pm. Tickets are $15 adult, with children’s tickets (age 12 and under) at $5 each. Get tickets online at www.singerscount.org and at local banks or from any member. Carol Allen is beginning her 21st year as Director of the Northeast Texas Choral Society. She says the choir has not only blessed her life but given her the kind of creative outlet she would have wished for. It was founded as a non-profit organization in 1998. Two semesters are held annually, each leading up to a public concert; one in the Spring and one during Christmastime. Rehearsals are held each Monday evening through most of the year. Auditions for new singers are also held twice per year. Who are the 100 joyful people who make up the membership of the Choral Society? According to northeasttexaschoralsociety on Facebook, “we are a non profit choir based in Sulphur Springs, TX with a membership from the surrounding counties. We are your doctors, lawyers, coworkers, etc., and we love making music together!”.